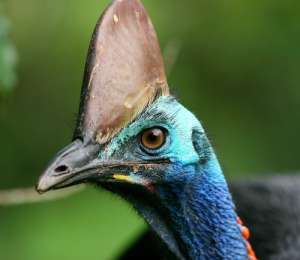 The name Cassowary is derived from the Papua New Guinea word “Kasu” meaning horned and “weri” meaning head which refers to the horn-like casque on the bird’s head. The Southern Cassowary (Casuarius casuarius johnsonii) is a subspecies of the PNG southern double-wattle form and it occurs in three unconnected populations from the North-East coast of Cape York Peninsula to Paluma just north of Townsville. The Cassowary is one of the heaviest native land based animals on the Australian continent; many texts refer to the larger female birds as often weighing as much as 60 kg compared to an average of 35kg for the males. In fact there are records of females weighing in excess of 85 kilograms. The Red Kangaroo male, Australia’s largest macropod weighs in at around 85 kilograms where as the Emu is generally around 40 kilograms. 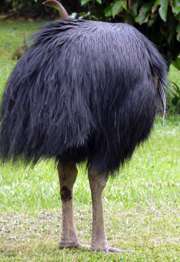 The Cassowary casque consists of a porous, pliable centre with a relatively hard exterior covering of keratinous material. The casque can continue to grow, often curling to one side as the bird’s age. In some instances the casque can be used to identify individual birds. Cassowaries can live up to 40 years in the wild and some captive birds have lived longer than 60 years. Cassowaries do not have a tongue so they manipulate fruit in their beak by tossing it about. In order to drink, they literally scoop up the water with their lower bill. The first sign of a Cassowary is often a deep rumbling sound which they make by resonating air in their chest cavity causing drumming or sometimes booming sounds that carry great distances even in dense rainforest. Cassowary plumage appears thick and almost fur-like due to their double-shafted feathers which seem to keep the bird relatively dry although they have no ability to repel moisture like some water birds. 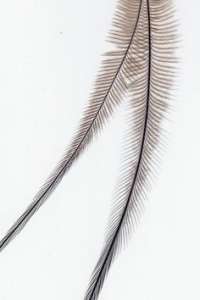 The wings, much reduced in size, carry about 6 long quills which curve around in front of the massive thighs. Quills are visible on the right-hand side of this bird; along with the thick plumage they seem to assist the bird to traverse the most thorny and inhospitable forest with relative ease. Cassowaries can swim and have been observed swimming in the sea at Mission Beach to escape marauding dogs. They are also known to swim across the Daintree River. They are able to shed water easily by shaking much like a dog does. And have been observed on more than one occasion to eat small aquatic life that drop out of their feathers after enjoying a bath in a creek in the forest. Courting and mating usually takes place in May and June with about 3 to 5 eggs being laid in a rudimentary scrape on the ground. The female departs after the egg laying, leaving the male in charge. He incubates the eggs for approximately 50 days, often without leaving the nest to eat or drink and then cares for the chicks for at least the next nine months, sometimes longer. The hatching coincides with the fruiting of many favoured rainforest species, particularly those of the laurel and myrtle families.